Maungdaw, Arakan – Myanmar’s newly appointed Border Guard Police Chief Police Brigadier General, Thura San Lwin, ordered the Rohingya villagers from middle hamlet of Kyi Gan Pyin village tract in Maungdaw Township to leave their homes on October 23, 2016. A rumour has been spreading around since that night that the villagers were asked to return to their homes. This is untrue. 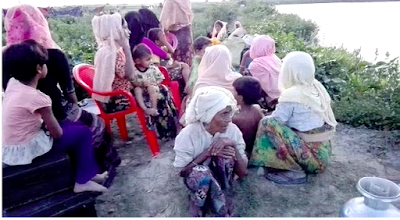 Over 300 families became homeless after BGP chief ordered the villagers from middle hamlet of Kyi Gan Pyin village tract to leave their houses within 24 hours. As this rumor has been spreading since the night that people were forced to leave their houses, an investigation has done by RB News. “It is not true that they all were asked to return home. The order was given by BGP. I think the military were not informed. The people couldn’t go far away from the village during this very short time. Some stay nearby the village. Today at 10 am a group of military was patrolling and saw a few families who are only children and women. Military asked them to return homes but they afraid very much and told the military that they don’t have keys. So the military go a house of them and destroyed the key. Then the military went into that house and searched inside. They found Kyat 600,000 and took them and let the families get into the house. When the men came to know their families inside the houses, the men came back to their houses from the places where they were hiding. After about an hour BGP came and arrested all of them from houses and took them to BGP headquarters. They were severely tortured and released later.” a villager told RB News. According to him, a total of 35 members of the families were arrested, tortured and released. They all are from Nawdinn sub-hamlet which is in the middle hamlet of Kyi Gan Pyin village tract. “The news what you all are hearing about the return of our villagers is completely untrue.” he added. Furthermore, the villager explained how their 14 rice bags were destroyed by the military. On October 23, 2016, there was a meeting at Maungdaw district general administration office where Western Command Commander, BGP Chief Thura San Lwin, other military officials and district and township administrator joined. BGP Chief clearly stated in the meeting that he will cleanse Wa Baik and Middle hamlets of Kyi Gan Pyin village tract.